The report analyses the INDCs submitted by 75 developing countries or emerging economies which account for the vast majority of tropical forest cover. Current commitments to reduce greenhouse-gas emissions fall far short of what is needed to prevent dangerous levels of climate change. According to the United Nations Environment Programme, the Intended Nationally Determined Contributions (INDCs) submitted by countries to date would likely result in a catastrophic global average temperature rise of 3-3.5°C, even if all conditional targets were met. But more ambitious action to protect forests and restore degraded lands could go a long way towards closing the gap between current proposals and what science says is needed. 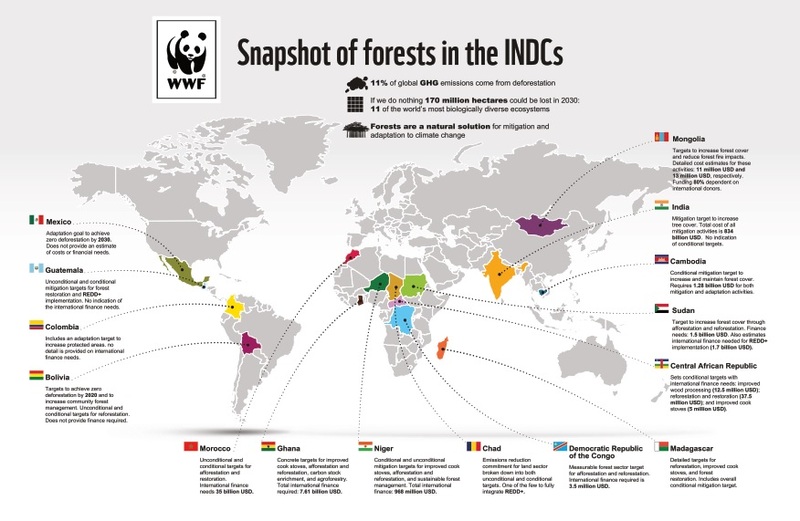 WWF’s report INDC Analysis: An Overview of the Forest Sector looks at the plans countries have laid out for reducing emissions from forest loss, and identifies opportunities for forest countries and donors to make a bigger contribution. 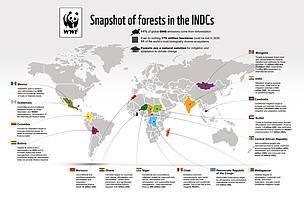 The report analyses the INDCs submitted by 75 developing countries or emerging economies which account for the vast majority of tropical forest cover. 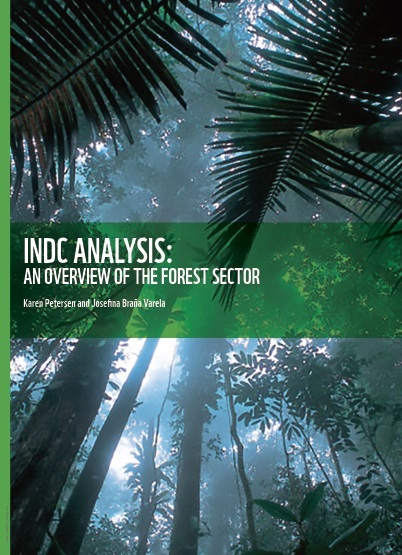 Of the INDCs analysed, over half establish one or more concrete goals in the forest sector. These include targets for afforestation, reforestation and restoration; to maintain and/or increase forest cover; for sustainable forest management; and to increase the uptake of improved cook stoves, which use less firewood. The review highlights a number of ways to augment the role that various forest conservation and restoration actions can play in reducing the emissions gap. These actions can also help countries adapt to climate change and achieve wider sustainable development goals.